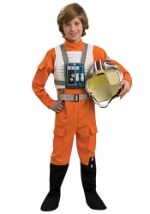 Start your infant or toddler's love of Star Wars early with our X-Wing fighter pilot toddler costume. Our X-Wing fighter pilot costume is a very soft polyester/flannel romper that snaps in the back and between the legs. The matching hood completes this officially licensed Star Wars costume. This unique Star Wars costume for babies is available in toddler and infant sizes!